Har Adar security head reveals terrorist's actions that now, looking back, were indications of his plans. 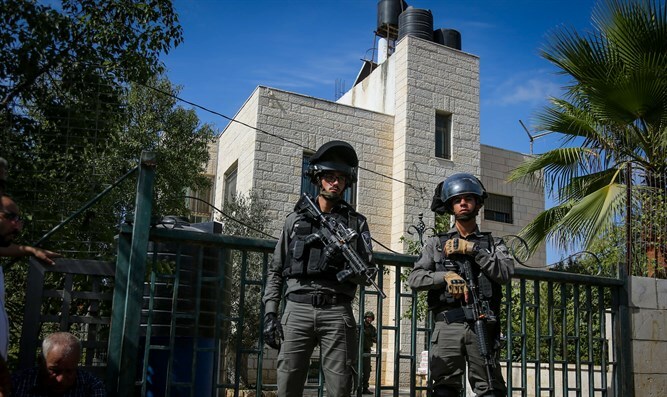 Anat Kanfu, head of the security detail in th e town of Har Adar outside Jerusalem where on Tuesday a Palestinian Authority Arab with a work permit pulled out a pistol and murdered a Border Police soldier and two guards, spoke to Israel's Reshet Bet radio this morning. Kanfu described the town's efforts over a period of years to build an atmosphere of friendly coexistence with the nearby Arab village in which the terrorist lived. "Things will never be the same," she said. "We would visit, invite them to our children's weddings, sit down for a cup of coffee before they began work. Now all I can think of is what could have happened had he managed to enter the town." Asked whether there had been any signs that the terrorist, the 37 year old father of four children and a well-liked cleaner in a Har Adar home for years, was changing his attitude, she said that the murderer began wearing earphones as he worked about six months ago, obviously listening to something which she now, with hindsight, imagines were inciting speeches. "This is how it is," she said. "They hear incitement and eventually they act on it. Their leadership encourages them to kill, looks for those who have problems in their personal lives." She added that several months ago, he told his employer that he would stop working in September. Kanfu's revelations cast doubts on Initial investigations which indicated that the fact that the murderer's wife had left him for Jordan a short time ago after incidents of domestic violence was the trigger. He left a letter apologizing to her, hinting of his plans. Kanfu described her interview yesterday on the Qatar-based Al Jazeera network, saying that she asked the interviewer rhetorically if Arabs in the PA have to have guards checking those who enter their towns, stores, shopping malls - if Arabs have to worry that their children and families will be murdered by an Israeli who randomly shoots because he wants to kill Arabs. When told that there are IDF raids, she answered forcefully that whoever is responsible for violence is going to get hurt, because once there has been violence, the IDF will attempt to prevent its recurrence and that kind of operation can never be free of injury.